The first total solar eclipse touching the continental United States since 1979 touches down on the Oregon coast between Lincoln City and Newport at 10:15 a.m. PDT. 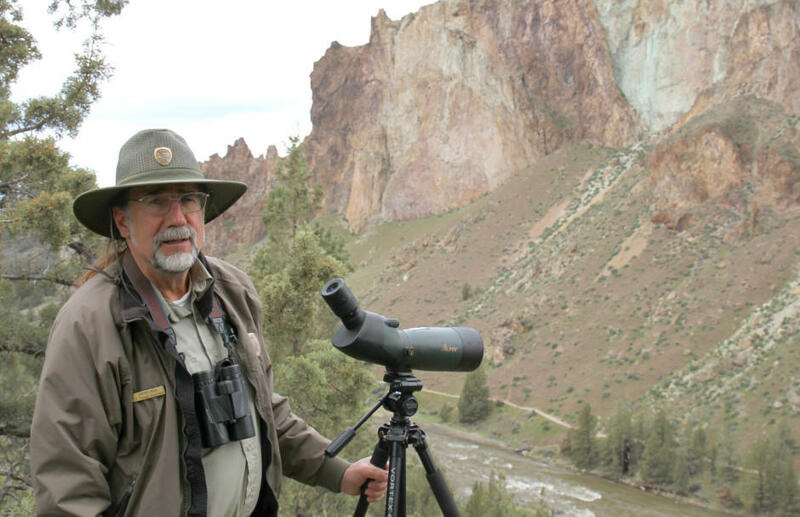 Smith Rock State Park naturalist Dave Vick peered through his spotting scope perched on a red rock cliff. He pointed the scope toward a tall ponderosa pine, spotting a downy mass in the middle of a 6-foot-wide nest. Inside was a 2-week-old bald eagle, or eaglet, named Solo because he was the only hatchling in this year’s brood. With all bookable lodging taken, eclipse watchers are expected to spill over onto public lands to see the event. It was a typical quiet, spring day for these raptors and the many other species in the park. 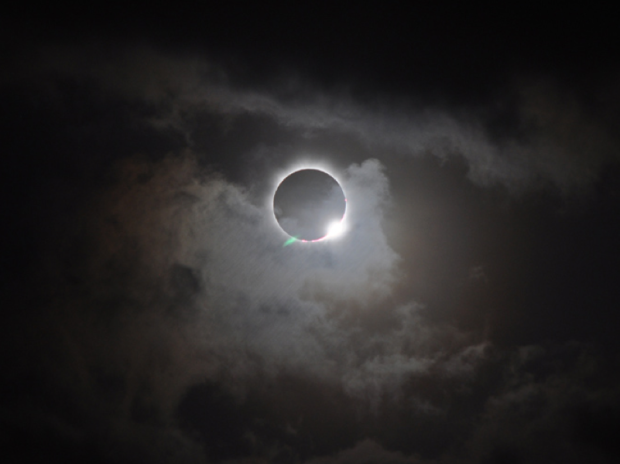 But come August, Solo and the other park wildlife will experience a rare celestial event — a total solar eclipse that will travel across the entire midsection of Oregon. For two minutes, the park will go dark. Nocturnal creatures will stir, daytime animals will fall asleep, and the temperature will drop dramatically and suddenly. 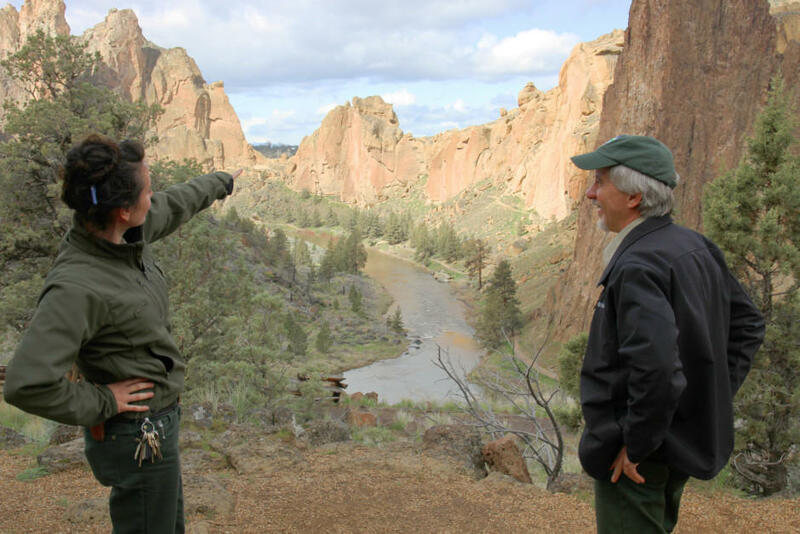 Ranger Josie Barnum and park director Scott Brown survey the valley in Smith Rock State Park. The park already sees crowds of at least 2,000 visitors on a weekend day. During the solar eclipse, there could be double or triple the visitor volume. Thousands of human visitors are expected to visit the state park, and many other wild places within the eclipse’s path, to experience the rare event. 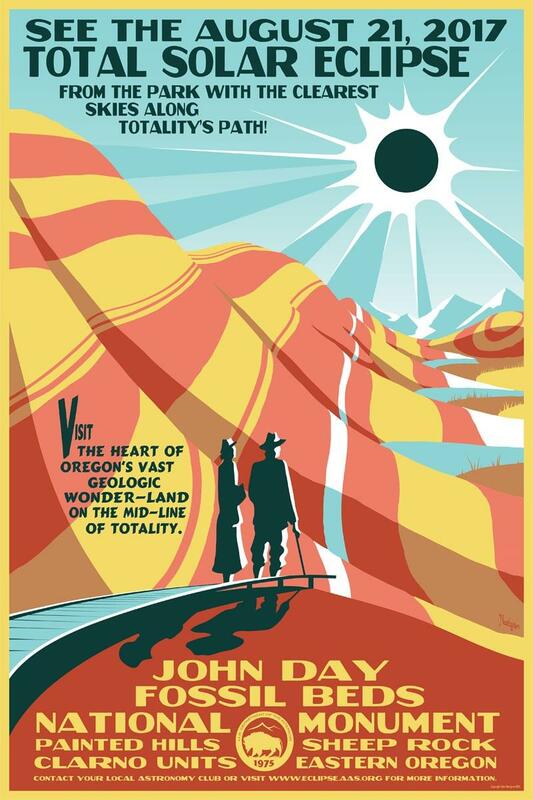 And land managers are expecting still more people who want to experience the eclipse in a memorable, wild setting to flock to rivers, wilderness areas, mountain peaks and lakes. All those people amount to a huge amount of planning for public lands agencies — and potential problems. All reservable campsites at Smith Rock are booked for the eclipse. The same goes for pretty much every other state park, U.S. Forest Service, and Bureau of Land Management campsite, as well as cabins, vacation rentals and motels within the path of totality. With all bookable lodging taken, eclipse watchers are expected to spill over onto public lands to see the event. Estimates of as many as 1 million visitors means land managers are working hard to protect the many sensitive, wild places within the 70-mile belt of the eclipse. That includes educating visitors on how to protect wildlife. In addition to bald eagles and other raptors at Smith Rock, there are river otters, nesting golden eagles, mule deer, snakes and more. Huge crowds of human visitors can interrupt critters that are hunting, sleeping or caring for their young. Smith Park naturalist Dave Vick is concerned that expected crowds during the solar eclipse could impact wildlife like the park's resident bald eagles. “The biggest issue is just stress for the wildlife,” Vick said. Stress can lead to sickness, weakness or even death for sensitive species. He’s particularly worried about bald eagles being harassed by drone users. Drones are banned in Smith Rock park, in part because of their noise. But during a special event such as the eclipse, there might be some rule-breakers who want photos of the celestial event. “All these sheer cliffs really amplify and echo that noise,” he said. Also within the park are delicate, ground-dwelling mosses and lichens that can be easily crushed. Land managers are concerned about potential damage to places like the John Day Fossil Beds, where one misstep can destroy irreplaceable fossils, and pristine spots within the Mount Jefferson Wilderness Area that could be overrun with illegal fires, trash and human waste. Land agencies teamed up to create a special blog where campers and other visitors can get information about the eclipse and public lands. Budget-strapped agencies like the Forest Service already face challenges with hiring an adequate number of wilderness rangers and law enforcement officers. Smith Rock State Park has only five full-time staffers plus a few volunteers. Rangers from other parks will be on site for the eclipse, but that’s still just a handful of employees for thousands of visitors. That equation will be about the same at Forest Service and BLM campgrounds, trails and dirt roads. And with the eclipse happening during one of the hottest months of the year, there’s one topic that comes up at every eclipse planning meeting: wildfire. “We’re concerned about fire danger,” said Josie Barnum, another Smith Rock ranger. She’s hoping visitors obey the park’s bans on campfires and smoking. With so many people in these wild spaces, the likelihood of serious injuries requiring search and rescue teams goes up. Rescues gobble up time and resources. “That takes staff away from other priorities happening up here,” Barnum said. And that’s assuming rescue crews can even get to an injured hiker. Highways and roads are expected to be clogged on the day of the eclipse. To limit crowding, officials will close the road into the park once it’s full. Latecomers will have to walk 1/2 mile or more to reach the entrance. Sheriff’s deputies and fire crews will be staged nearby. The park will have emergency medics at the ready on the canyon rim. There will be education and interpretive sites about “Leave No Trace” ethics and park rules banning drones, smoking and fire. Agencies all across Oregon are taking similar precautions to protect places in the eclipse path, including the Painted Hills and the Mount Jefferson Wilderness. But despite all the extra work and necessary precautions that go into planning for a day like this, Barnum is excited to experience the eclipse in the place where she works. When the eclipse first touches Oregon, the Moon's shadow is racing at approximately 3,400 miles per hour. “They call me SEL for short,” Vattimo said. “A lot of people tell us, quit inviting them in! Quit advertising this thing,” Vattimo said. 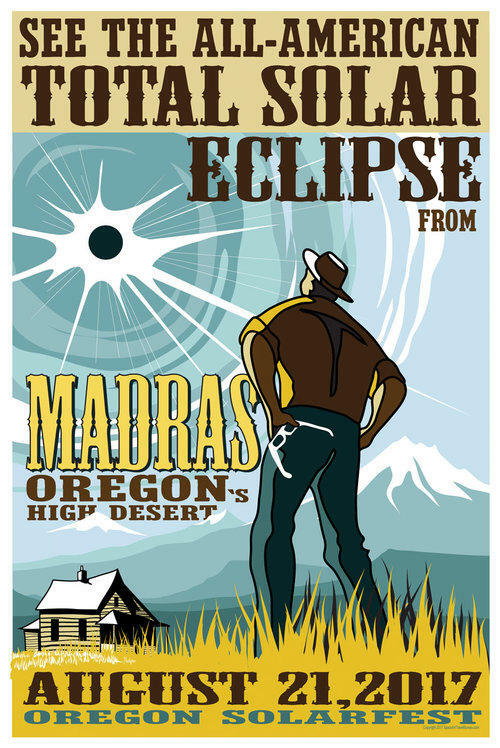 But it wasn’t the city of Madras that picked Jefferson County as a hotspot for the eclipse viewing. Astronomers did. And with so many campers in town, the grocery stores have a plan to stay stocked: they’ll park refrigerated semi-trucks behind the stores full of produce, meat and other barbecue supplies. “We’ve talked to businesses about running on cash. Which then involves banks. And talking to banks to make sure their ATMs are all stocked up. Well, ATMs also run on internet. … So there’s a trickle-down effect,” Vattimo said. “When the eclipse is over and that big mad rush of people that says ‘all right get in the car, we’re leaving! I think you’ll be in a hurry to go nowhere fast,” Vattimo said. OPB’s Amanda Peacher is a multimedia reporter and producer covering Central Oregon based in Bend. 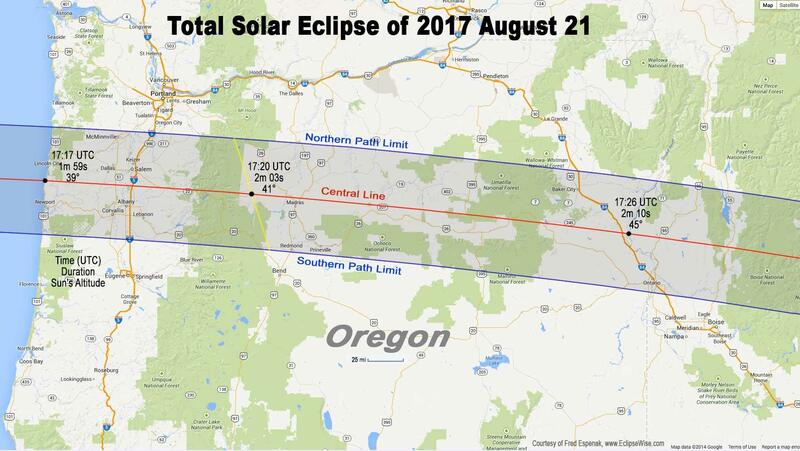 Upward of a million people are expected to flood Oregon for the solar eclipse on Aug. 21, which has cities across the state scrambling to prepare. Some, like Madras, have been planning for months. Others are just beginning. Nestled along the John Day River is one of the smallest towns in the eclipse’s path of totality: Spray. Population: 160 people, one convenience store, one gas pump and one small food counter that closes at 6 p.m.
Drop into this bucolic setting 8,000 to 12,000 visitors, the town’s estimate for the eclipse, and you have a mind-boggling ratio of about 100 tourists for every townsperson. How is that going to work? On a Tuesday evening, some 20 people gather in a church recreation room that doubles as a community center to try to figure it out. Wheeler County commissioner and Spray city council member Debbie Starkey leads the meeting along with her husband, Phil, the area’s superintendent. Consider Starkey Spray’s chicken little. She went to a county meeting in January and realized that nearby cities were way ahead in planning for the eclipse. The meeting-goers spend several hours trying to cover all the minutiae of accommodating and catering to thousands of visitors with limited resources and a tiny working adult population. These are issues towns all along the path of totality are grappling with. The concerns range widely, from whether the town could run out of water to where the incoming hordes will park. After all, there’s only one main street in town, and no one wants their small streets lined with stranger’s RVs. How are you going to keep everyone safe in an area prone to forest fires, heat stroke, and snake bites? As the group repeatedly points out, to cover the county’s 1,715 square miles, there’s only a half-dozen deputies, four ambulances and one medical clinic (the nearest hospital is 90 minutes away — with no traffic — in the neighboring county). Which means local volunteer EMTs and firefighters might not get much sleep. Nor likely will Allen, who doubles mayor and the town’s only physician assistant. How are you going to house and feed all of these people when there is only one motel and one convenience store? Like neighboring towns, Spray is looking to turn any big patch of grass — such as the school and town park — into campsites, where they hope to house anywhere from hundreds to thousands of campers. Several ranchers are planning to turn their fields into campgrounds at hundreds of dollars per site for the weekend. Some are gearing up to offer water hookups, food and even entertainment — full weekend mini-festivals — while others will just provide space for toilets and to pitch a tent. “We’re planning up to 375 campsites,” Frank Asher chimes from the back of the group as the Starkeys try to add up how many people the town can handle. Asher’s plans are by far the biggest in the county: accommodating potentially 3,000 campers (the maximum occupancy under the county permit), although he’s offering the barest of necessities: space, bathrooms, and access to the river and hiking. In tandem, local groups are debating cookouts to feed all the campers. The school is thinking of hosting a bake sale; the local grange is considering a biscuits and gravy breakfast; others are considering breakfast burritos or cowboy breakfasts. “Nobody’s really talked about something like a potato bar, a spaghetti feed or anything for lunch, so those things are sort of open,” says Debbie Starkey as she runs through the list, writing everything on a giant pad of paper at the front of the group. Some, like Asher, see big economic potential. “We just decided that we would step up to the plate and try to get some folks to come to Spray,” he says. “Maybe give our economy a little shot in the arm, because we definitely need it.” The hope is visitors would love the area so much they would come back again. To attract visitors, Wheeler County, like neighboring Grant County, created a webpage with links to all the camping, housing and food options local people are offering, in addition to existing restaurants and gas stations. But the economic opportunity comes with a big gamble: No one knows how many people are coming, so it’s risky for a low-income region to stock up on food, ice, and help and have it go to waste. “Let me just talk about the port-a-potties, because that was my big thing,” Starkey interjects later, again to a round of laughter. She tells everyone that Spray is spending $13,000 to rent 94 port-a-potties for the area. Like many neighboring towns and agencies, the eclipse is resulting in an outlay of money that many don’t have, with little guarantee that they’ll recoup the costs. What everyone worries about is that visitors don’t realize this is frontier country. Basic things like food, gas, cell service, and water are going to be in short supply, so like the people of Spray, visitors are going to need to plan ahead. Aaron Scott is a producer/reporter for the weekly arts radio show State of Wonder at Oregon Public Broadcasting, where his stories have won a Gracie Award for Best Soft News Feature, an Edward R. Murrow Award for Use of Sound, and an APTRA Mark Twain Award for Best News Writing. These pieces were originally published by Oregon Public Broadcasting at www.opb.org. If you think it's tough to book a hotel room at the Oregon Coast in the height of the summer season, just wait until August of 2017. The 21st of that month, to be precise, when a total solar eclipse hits the central coast. That's when the moon moves in front of the sun and the Earth moves into its shadow.